You know the mental file of recipes that you think about for years, the recipes that you intend to make when the time is right, the ones you know will be great when you finally do prepare them? I’m delighted to report that one of those has moved from my mental file into the realm of reality. 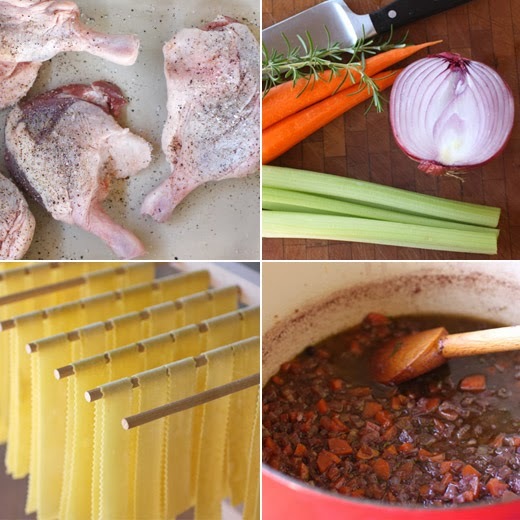 Since 2006, I’d been pondering the making of the Duck Ragu from On Top of Spaghetti . I knew it would be perfect for a winter meal on an occasion when I had plenty of time to roast the duck legs and then let the sauce slowly simmer. I knew I wanted to save this for a day when I could make homemade pappardelle to go with it. All of those conditions were finally able to be met for a Christmas meal. Every time I mention cooking from this book, I also mention that it’s one of my favorites. It has never let me down and certainly did not this time either. Although there is a recipe for homemade pasta in this book, I have another favorite that I turn to for especially rich pasta dough. Once again, I made the fresh pasta dough from Stir which incorporates whole eggs as well as egg yolks. It worked out perfectly since I had a use for the whites for dessert. I made the pasta and cut the wide, pappardelle ribbons a day in advance. The sauce takes some time to allow the flavors to develop, but it couldn’t have been easier. This was actually my first time cooking duck at home, and I know it won’t be my last. There’s not much to cooking the duck in this case. Two pounds of duck legs were roasted in the oven for about 40 minutes. You’ll need a roasting pan that can go from oven to stovetop for deglazing. Of course, there’s duck fat that’s rendered as the legs roast, and I greedily poured that into a bowl to save for cooking potatoes at a later date. With the cooked duck and fat removed from the pan, the pan was then set over low heat on top of the stove. A half-cup of red wine was used to deglaze it. While the duck was roasting, onions, carrots, and celery were chopped. Those vegetable along with chopped rosemary, and a few juniper berries were cooked in olive oil in a Dutch oven until very tender. The deglazing wine and any bits from the roasting pan with another cup and a half of red wine were added to the vegetables and left to simmer and reduce until almost completely evaporated. Next, stock and canned chopped tomatoes were added. I used a homemade chicken stock, but duck stock would have been great. As the sauce began to simmer, I pulled the meat from the duck leg bones and shredded it to add to the sauce later. With meat and skin removed from the bones, I added the bones to the sauce. The sauce continued to simmer for another 45 minutes or so. Then, the bones were removed and the shredded meat was added. Fresh pasta cooks quickly, in about a minute or two, and the cooked and drained pappardelle was tossed with a bit of sauce before being plated. It was topped with more sauce and grated parmigiano. This dish was definitely worth the wait. But, now that I know how easy it is, I won’t be waiting long to make it again. It is a rich and hearty sauce with layers of flavor from the duck and wine. At last, I can stop wondering when I’ll ever make this dish, and instead, I can daydream about how delicious I now know it is. Me encanta esta carne exquisito plato,saludos y Feliz Año 2014,abrazos y abrazos. Ohhh.... duck!!! I love duck and I can't resist a duck dish. The fresh pasta look stunning. Thank you for a great New Year dish! Happy 2014! A wonderfully comforting and extremely tasty dish. What a mouthwatering duck dish with homemade pasta! Beautiful recipe, perfect for the holidays, you really hit a jackpot there! 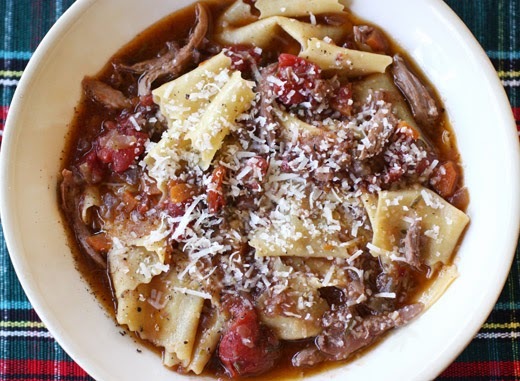 I think I'll daydream right along with you, at least until I get the ingredients for this winning dish; the duck ragu is a delicious complement to the homemade pasta! yummy! this looks great, Lisa! I've got a duck in the freezer and am plotting what to do with it! I may roast it, or may butcher it and do the breasts for one meal, the legs for another. 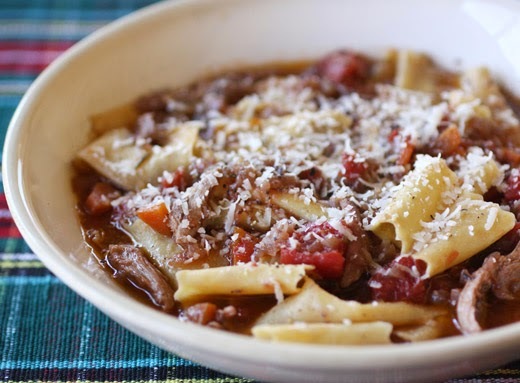 I love the idea of this duck ragu! I've made something similar with turkey, but duck sounds better. Really nice - thanks. Easy, you say! It looks fabulous and reminds me of sauces we would eat in Italy in restaurants. Your pasta is gorgeous, perfect and the sauce look soooo good. Do I dare try this? yes, definitely dare to try it! this is just the pinnacle of comfort food. gorgeous and delicious dish! OMG Lisa, homemade pappardelle...looks fabulous especially with duck ragu...what an awesome dish! That's a brilliant idea and a perfect recipe for this season. Your first time making duck? Looks like you nailed it, Lisa! Tyler would love this Lisa. Your pasta looks so pretty and dainty. Nothing better than fresh! My first thought was this had something to do with Duck Dynasty! You fussed. :) So wish I was a neighbor so I could have a taste. Lovely dish, Lisa. I have never heard of this dish but it certainly sounds delicious. Your pappardelle looked lovely drying on the rack. I hope you had a lovely Christmas! This looks wonderful. I love these sorts of recipes on cold, cold winter days.